I’ve gotten into a bad habit when buying movies, especially back catalogue movies, in that if I’m interested in the first part of a franchise, I tend to get them all, and then leave them languishing on my to-watch pile until I get a chance to see them. That has on occasion resulted in abject disappointment when I got to a really poor sequel, and I’ve often discussed the false economy of boxset and collected releases before. This time, I chanced upon the current action movie franchise of choice in the supermarket, and I managed to restrain myself. I only bought the first John Wick film. 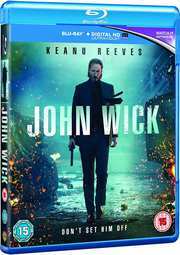 John Wick gets a 2.40:1 widescreen 1080p transfer on this disc, and it’s pretty decent. About the only niggle I had was with some shimmer on fine detail, noticeable in daytime aerial shots of cityscapes, and distant skyscrapers. Otherwise the image is clear and sharp, with strong detail. Bright, natural colours are saved for the flashback sequences, but once we enter John Wick’s world, we see a highly stylised and graded colour palette that reflects the criminal underworld, and the heightened, fantastic feel of the story. There are a lot of blues and greens, while warmer shades are desaturated. It’s an effective storytelling device, but it means the image doesn’t really hit the heights of pin-sharp HD. You have the choice between Dolby Atmos English (with a TrueHD 7.1 core), and DD5.1 Surround English Audio Descriptive with optional SDH subtitles. The film really makes use of the surround to immerse the viewer in the action. The dialogue is mostly clear, aside from a couple of mumbled lines, while the music drives the pace of the story well. You get one disc in a BD Amaray, with a by-now expired UV code. The disc boots to a static menu. The film gets a commentary from directors Chad Stahelski and David Leitch. Don’t F*#% With John Wick lasts 15:17 and sees Keanu in training for the role. Destiny of a Collective lasts 6:19 and offers some background on the directors. There are three featurettes going behind the scenes of the filming in The Assassins Code (5:17), The Red Circle (6:27), and N.Y.C. Noir (6:00). This is what over a decade of Marvel and DC movies owning the box office has reduced the Hollywood action movie to. John Wick is a comic book action movie that isn’t based on a comic book. It’s actually an original script. But it’s shot like a comic book movie, and it plays out just as simply. It’s pure style over substance, visual flair and brilliant action and stunts. It’s a whole lot of fun to watch, and offers as much intellectual nourishment as mental chewing gum. I probably coloured in the story to offer that four sentence précis of the film. You don’t even need to know that much. All you need to know is that John Wick gets p***ed off, and he doesn’t stop until those that p***ed him off are all dead. The film excels in colouring in its world. The stylised criminal underworld, the visually memorable characters, and the ‘assassin’s code’ make for a far richer canvas than the simple story actually needs, but you do begin to appreciate the visual and narrative style. It’s easy to see how a film like John Wick might have inspired something like 2016’s Re:Born, the Tak Sakaguchi revenge actioner which I reviewed last year. 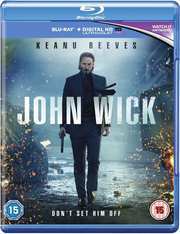 John Wick shares that film’s weakness of characterisation, although its action sequences are even better choreographed and executed, and a lot more imaginative. I’ve a soft spot for revenge movies though, and when I compare John Wick to films like Get Carter, Park Chan-wook’s Vengeance trilogy, or even Payback, Mel Gibson’s remake of Point Blank, then John Wick just comes up short. Comic book style over wafer thin substance means I’m only watching the film for the action, couldn’t care less about the ephemeral characters, or even the puppy. For once, I’m glad that I didn’t succumb to temptation and get John Wick 2 alongside this film, although I’d probably enjoy it if I did watch it.